Grace Century announces that visionary IT firm, The Quantum Group, Inc., continues to build its IT portfolio and position itself for U.S. Launch. The fact that this firm has been able to complete the process for seven groundbreaking patents is a testimony to Quantum’s visionary team and their ability to influence the $6.4 trillion USD healthcare industry. Grace Century, an international research and private equity company based north of Dubai, in the United Arab Emirates (UAE), is pleased to announce that on May 1,2014, The Quantum Group, Inc. received notice from their patent attorney stating that the examiner from the United States Patent and Trademark Office (USPTO) contacted them to advise that their patent application # 13/302,557 “System and Method for Automating and Verifying Product Value, Usage, and Suitability for Use or Sale” has successfully completed all reviews by the USPTO and is ready to be issued. This is the seventh (7th) patent issued or cleared for issuance to Quantum. Quantum has another 15 pending approval. The patent builds on Quantum’s previous approved portfolio and is a testimony of management’s ability to navigate through multiple government channels. Quantum management sees this patent, as with several of their others, as having material applications beyond healthcare, including, yet not limited to food processing, shipping, supply chain management, industrial productions, e-commerce, financial services and banking, even into law and education. Grace Century FZ LLC is an International Private Equity Consultant located in Ras Al Khaimah, United Arab Emirates. It specializes in conducting due-diligence for its group of international members, as well as assisting firms in the development and execution of “game changing” ideas in Life Sciences. Grace Century assists in capital formation, market penetration, joint ventures, and brand development plan. 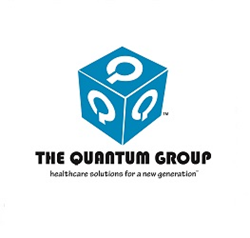 The Quantum Group is an innovation-driven organization purposefully designed to bring effective change to the U.S. healthcare industry. The foundation of the Company has been in design, development and deployment of innovative solutions, technology, products and services to the healthcare industry. Its purpose is to assist physicians and hospital providers, as well as government and private sector payers, in managing the treatment outcomes through patient-centered wellness concepts. For more information, visit http://www.quantummd.com. PWeR stands for Personal Wellness electronic Record®. This 21stcentury healthcare technology solution is a new breed, intelligent healthcare information platform that hosts medical records and permits interactive use. Medical records will follow the patient, giving every healthcare provider that sees a particular patient access to all the information needed to assist in their diagnosis and treatment plan. Providers will be able to access a patient’s entire medical record in one glance, through our trademarked “One Patient…Total Connectivity”™ concept. In critical situations or in providing treatment to patients on the PWeR platform, hospitals will be enabled to access full medical histories and make educated treatment decisions based on accurate data. For more information, visit http://www.mypwer.com.